The Community Market Gardens programme is an income-producing vegetable production initiative highly suited to the South African agriculture landscape. The programme develops and supports small-holder producers who have passed the threshold of sustainable agriculture but are not yet producing at the scale of a commercial farmer. These community market gardens have the potential to produce a significant amount of food, however. Projects involved in the Community Market Gardens programme often underpin the food security of local community (and beyond) while providing the small-holder with a good income and a sustainable livelihood. What is a Market Garden? A market garden — also referred to as a micro-farm — is a small-scale production system of vegetables, herbs, and fruit grown as cash-crops. The intensity and diversity of crops produced, as well as the land size, sets it apart from traditional farming methods. Crops are often sold directly to a community retailer but they can also be aggregated and sold to fresh produce markets. 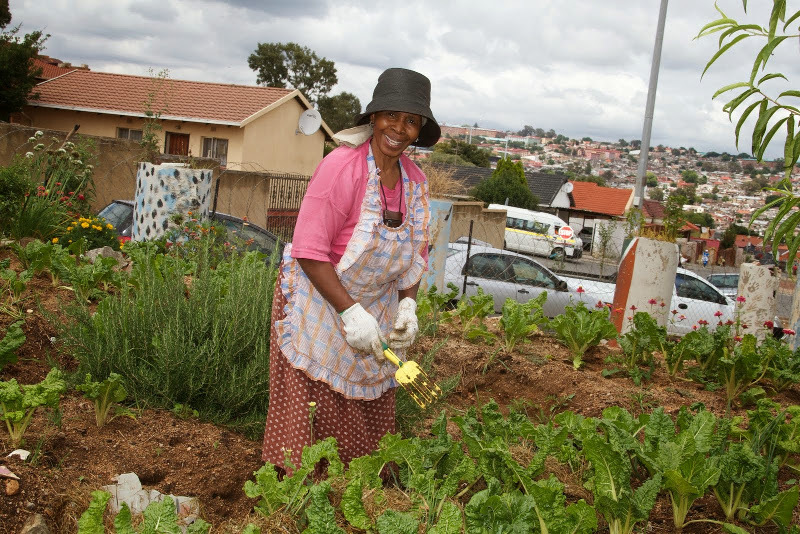 In South Africa, community market gardens play important social and business roles. They function as mini-hubs for socialising, agro-processing, and other small (unrelated) business activities. While not a hard-and-fast rule, they are often characterised by groups of women who take responsibility for plots on a larger parcel of land individually, in pairs, or as a small group. Only projects with an existing grounding in production and agriculture, and have undergone an FTFA assessment, are selected. We focus on bio-intensive agriculture and give priority to ecologically sound principles. Multiple cash-crops are grow in rotation systems alongside fruit and herbs. Equal emphasis is placed on technical skills and social dynamics to promote sustainability. We include the FTFA Business Box and basic administration as part of the intervention. Through our network we seek to establish a consistent market and supply chain for the project. Source of ongoing teaching for respecting of the environment and taking pride in one’s neighbourhood.